Today I need to show off my darling new little grand daughter. Last month I flew to Okinawa for my daughter's scheduled c-section which was scheduled four days after my arrival but my grand daughter was not going to wait. She knew that Grandma was coming and she wanted to come too. When no one was at the airport to greet me, I knew that my daughter was at the hospital. As I resigned myself to waiting in the airport, my daughter's friends arrived and rushed me to the hospital. We arrived five minutes after her birth...perfect timing for Grandma to enjoy all those special moments! She definitely is a miracle baby! Mom is doing well too! Well, today is another special day. It is Sweet Sketch Wednesday! Arlana has created another wonderful sketch for you to play with this week! 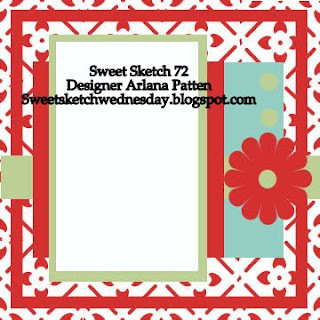 Digi Stamp Boutique for sponsoring Arlana's Sweet Sketch Wednesday site. We have loved using her fun images to create our cards with. 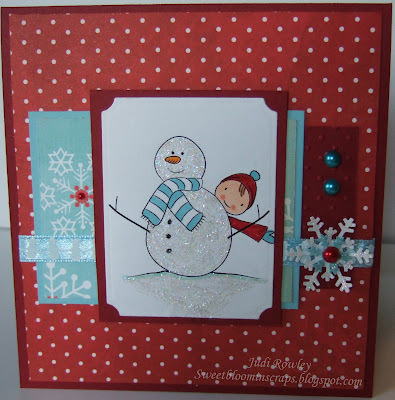 Below is Digi Stamp Boutique's Jack and Snowman. Isn't this image just adorable! Sally Ann creates so many new images every single month. I always have such a difficult time trying to decide which image I want to use. Right now I am just trying to enjoy her Christmas images. Every time I visit her blog she has added new images! You just need to take the time to visit her site and choose a few of your favorite images. Then be sure to stop by SSW and see all the fun DT cards that have been created for your enjoyment! A close up of Jack and Snowman! Oh would you just look at her!!! She is just adorable - congrats Grandma!!!! 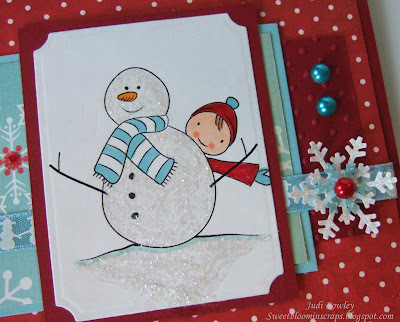 Another fabulous card - love the image! I think I may have to go shopping again at DSB!!!! Seeing your snowman makes me want snow really badly!! Oh Judi, this picture is just precious!! She is soo cute. Tara just had pictures taken of M. and I can't wait to get my hands on those. Your card is adorable as always. I sure love the blue and red together. Hi Judi, she is such a little cutie they are so precious at this age all you want to do is kiss and cuddle them. What a wonderful photo!!! I do love your card Judi great image and the colours are lovely together. Very pretty. Yes I have prenty of catch up to do and cards to make. Oh my goodness Judi - what a cutie pie! Gorgeous photo! Your card is also very cute, I love polka dots! Love the colours you've used here. Thanks for my top 3 badge. Awwww...she is absolutely gorgeous!! I love that pink headband and flower! You used my absolute favorite color combo for your card and it is just beautiful! All of the sparkle and the snowflakes and pearls are just perfect! Oh such a swettie!!! I bet you miss her. Your card is just the swetiest ever. it was so fun watching you make it. Thanks for all you do . Love and miss ya. Fab card also, Your sparkly snowman is adorable. Oh and your card is absoloutely awesome!! You used my favorite color combo. Jack and snowman image is just adorable. Hi Judi!! Your grandaughter is so precious!! Your card is darling too!! Have a wonderful week!! Congrats Grandma!!! That is a picture of a perfect little angel!!! And your card is out of this world adorable too!! I didn't see this image...it's a definite must have! Fun and fabulous colors and papers. And check out that sparkle too! Love it!